Free advice is often worth what is paid for it – nothing. Advice that is highly valued obviously will carry a higher price tag. But how to calculate the value of advice is challenging. Early-stage startups have an even more difficult time as they typically do not have any money to pay with, so they use the only currency they have – equity in their company. Creating a solid group of advisors is a critical milestone in most early-stage startups. An advisor brings legitimacy to a startup (a stamp of approval) – at least the founders have convinced someone else that they have a good product or service. Beyond basic legitimacy, the right mix of advisors should help accelerate growth as well as provide a more solid foundation for the company by leveraging business expertise and other domain knowledge. While there is a relatively “standard approach” to compensating advisors (see the Founder Institute’s FAST document), this is more of a starting point than a definitive rule. The details and specific composition of the startup should dictate the terms. There are four general themes founders should consider when assembling their advisors and determining equity and other compensation. How closely related is an advisor’s expertise to the focus or market of the startup? Some startups rely heavily on advisors that are key subject-matter experts in a specific niche or field. In a biotech startup, for example, it probably makes sense for advisors to have a strong science background – both medical and technical. In a consumer products startup, the focus may be on advertising and marketing, product development, and design; if not, advisors should have a prior successful venture or two. While advisors that have similar interests and market expertise are important, other advisors may bring more generic yet powerful skills to the table. Depending on the industry of the startup, the need for advice on how to navigate the logistics of international markets or finding and securing key channel partners may be of critical importance. Some advisors may simply offer their experience in managing and launching high-growth companies. What do the founders expect from the advisor? Here, it is worth noting that a disappointing majority of startups fail to use their advisors after a few months or quarters. Similarly, the obligations of an advisor easily become marginalized as they compete with the advisor’s other, more lucrative activities. While nothing cures apathy like success and energy, having a clear set of expectations defined and regularly communicated can combat the advisor doldrums. Some startups make a distinction between company advisors and the more formal advisory board. Company advisors are the ones that typically attend regular meetings and actively participate in the forum. Outside of this obligation, this group typically does not offer much more. Sometimes, this is where the “halo effect” is created: some startups focus on having the “right” advisors that bring star power and media attention. Often this is the only true role of that advisor, rather than actively guiding and getting to work with the founders. The actual board of advisors should consist of those who are willing to get their hands dirty to some degree and have the appetite and bandwidth to participate. This is where the action and value creation of an early-stage startup truly takes flight. Do the advisors have the time to devote and are they accessible? This is of critical importance, for if an advisor is non-responsive or unavailable, their value is negligible. Advisors by their nature are otherwise quite busy professionals. They have competing priorities and more lucrative ways to spend their time. Founders need to ensure that they are aligning the value that an advisor can bring with the amount of time they will need from that advisor. This must be clearly articulated from both sides. Again, if the founders are simply seeking to create a halo board, this element may not be so important. What is the reason the advisor is joining your company? Advisors have different reasons for joining a board. Some simply want to stay connected to an entrepreneurial endeavor. Others feel the need to give back and help budding founders. Regardless, the advisors better have a strong belief in your company and market. Like founders, advisors can get nervous and become dissuaded when an early-stage company hits a bump. Founders need the advisors to be advocates and believers in the company vision so that they can weather these troughs, and, in the worst case, lift the spirit of the founder or redirect the founder’s attention to more constructive energies. In the end, an advisor who does not actively believe in the startup’s vision ought not be on the board. 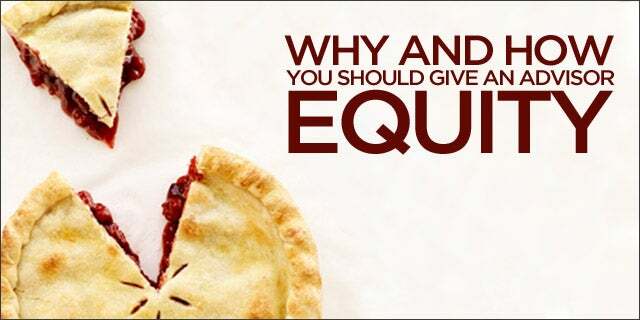 Equity is valuable to the founders, but it is only potential value to the advisor. Given that most startups fail, and that the time and effort of the advisor usually has real market value, becoming an advisor is not an easy decision. While a founder may want to simply rely on free mentorship, getting in touch or getting impactful advice may prove harder than it would be with an advisor who has a commitment to the company. The value in an advisor should be self-evident and therefore compensated accordingly.